Here is the feather information as promised. 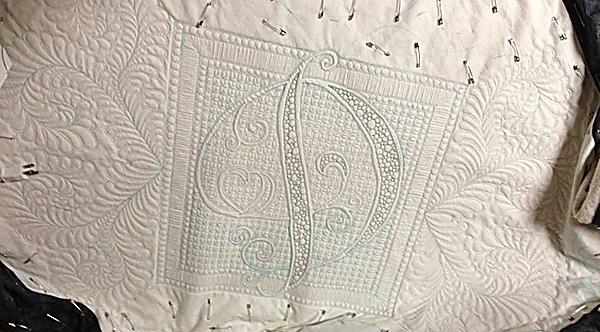 There are so many ways to quilt feathers. This is my preferred way. They turn out for me every time and I love the openness of them. You also do not have to do much backtracking! 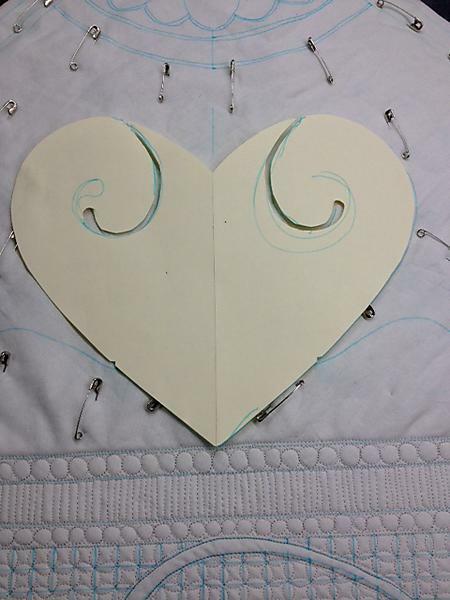 I make a “stencil” to make the spine shapes symmetrical and for me to know where the side spines should be placed. I quilt the whole spine first, which takes me back to the bottom of the feather. 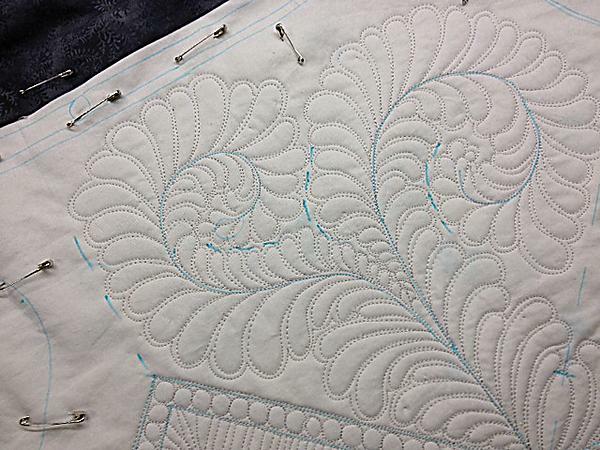 I then quilt up one side and echo back down that side, which takes me back to the bottom of the feather. 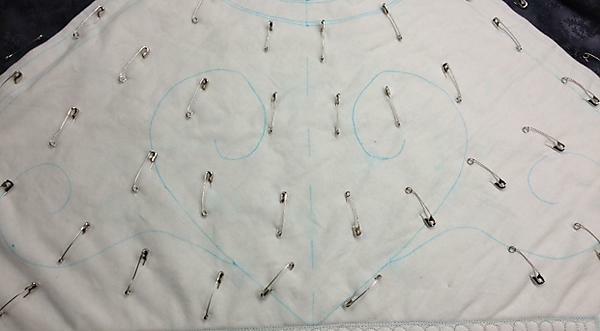 Then I quilt up the other side and echo down. Whenever there is a “v” shape in the feather (this happens when a side shoot off the feather is created) a new teardrop is formed in the “v” and then plumes are added on either side. To help me keep the feathers from overlapping, I mark “fences” to make sure that I do not go too far. In the picture below, the dashed blue lines are my fences. This picture compares a finished side and one side that needs the “v” part added. 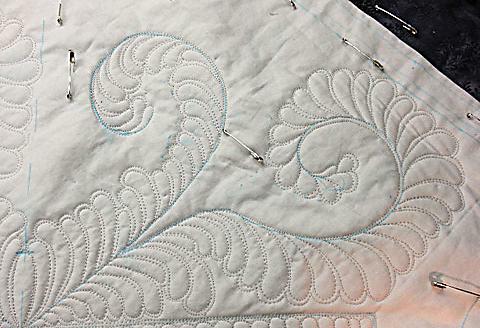 I was able to quilt the second feather today. 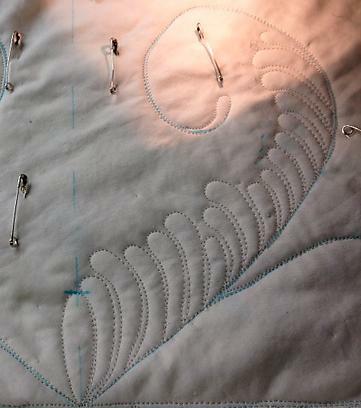 They take about 40 minutes to quilt each feather – they are quite large (16×20 inches).